Frugal Mom and Wife: Amazon Local Deals Up To 75% Off! Free Offers Too! 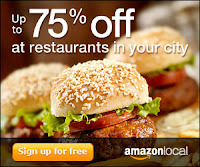 Amazon Local Deals Up To 75% Off! Free Offers Too! salons, and other businesses in your hometown. deal e-mails when they're in your city. if there is a Free offer like "Free $2 MP3 Credit", and more! It's Free and featured to your area. Save all over the place! !